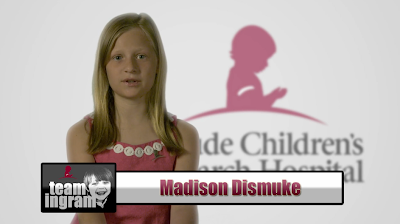 Madison wanted to start a team of kids in 2011 to raise money for St. Jude after watching her mother and father do so in the St. Jude Half-Marathon. Her parents were part of Craig's work team, Team Vining, which raised more money than any other team last year by raising $150,000. If there are three characteristics that describe Madison, they would be that she is compassionate, social, and entrepreneurial (in a non-money-making way). 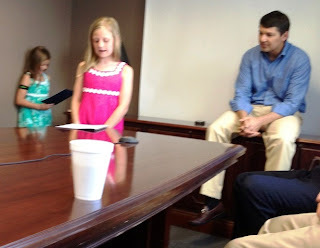 As such, she wanted to raise money for the kids at St. Jude (compassionate), but she wanted to do it with her friends (social) and making her own team seemed to make sense (entrepreneurial). Once her brother Ingram was diagnosed with cancer and became a St. Jude patient, she became even more determined to start a team. And that is how Team Ingram began. Madison and her sister, Lindsey, are trying to raise a lot of money to help the work at St. Jude. This is one of their ways to help their little brother. Their stated goals are to raise $100,000 and get 30 kids on the team. Secretly, they have a bigger goal. Our family loves the hospital because it truly provides Hope to everyone who walks through those doors. Finding cures and treating children with cancer is not a profitable business. Only through public support, from people like us, can the work being done at St. Jude continue. Below are some facts about St. Jude which make it a compelling place to support financially. Despite our intuition that a cancer hospital should be, St. Jude is not a sad place. It may well be one of the most joy-filled, happy, hopeful atmospheres you will ever walk into. The childhood cancer survival rate from 1962, when St. Jude was founded, was 20%. Today it is over 80% thanks, in part, to the work being done at St. Jude. The most common form of childhood cancer is Acute Lymphoblastic Leukemia (ALL). If you had a child diagnosed with ALL in 1962, their chance of survival would have been just 4%. St. Jude developed a successful treatment protocol for ALL and the survival rate is now 94%. It is arguably the best pediatric cancer facility in the world. The doctors and researchers are world-renowned. St. Jude published 680 articles in academic journals in 2010, more than any other childrens hospital in the world. St. Jude freely shares all of its research findings with doctors and scientists around the world. St. Jude is now working on many clinical trials to determine the most effective ways to treat childhood cancer. They are also working on a genome project to determine why cancer occurs in some children and develop individualized treatment protocols. No patient pays for anything at St. Jude - and when life is this stressful, that is a welcome relief. No matter if you are rich or poor, your child gets access to the best cancer treatment in the world. Over 75% of funding for the work being done at St. Jude comes from public donations. St. Jude's fundraising overhead is small. Over the past five years, 81 cents of every dollar given to St. Jude has gone to support research, treatment, and administration. Great Video! I have several of my coworkers and friends who want to join Team Ingram as walkers as well as donors. How may we do so? To join Team Ingram in the run, go to www.stjudemarathon.org and sign up to participate. Sign up as a "hero" and then join "Team Ingram." We will begin sending out updates to the team at the end of July. You can also sign up just as a fundraiser and not as a runner - same process. 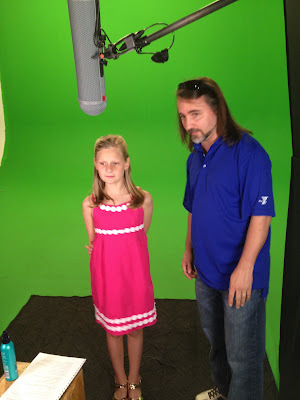 To join Team Ingram's quest of supporting St. Jude, you can go to http://heroes.stjude.org/teamingram and make a donation. Thank you for sharing the video and for your interest in joining with us.